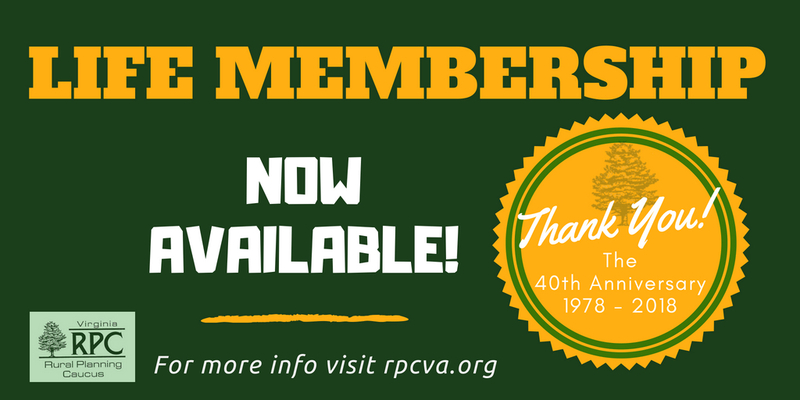 The Executive Committee of the Rural Planning Caucus of Virginia is pleased to announce a new Life Membership option for long-time members of the organization. An individual outside of these rules may also qualify on a case-by-case basis upon approval of the Executive Committee. 38 individuals are currently eligible for Life Membership and 18 have become Life members. A listing of these people can be found to the right. If a name has an asterisk (*) by it, we need your help in finding contact info for the individual - please email Andy Sorrell if you can provide info! In order to become a Life Member, all you need to do is to respond to Andy Sorrell letting him know you are interested. We will sign you up and you will get an email confirming your membership. After you receive that email, you will be able to sign in and pay your one-time $25 Life Membership dues online or print off an invoice and mail a check. If you are already a member by attending a recent conference, then there is no fee. Life Members will never need to renew membership - they are always an RPC member and as such they automatically get a reduction of the conference registration rate of whatever the annual membership fee is - currently that fee is $25 so for our 2018 conference, the conference registration rate is just $100. Note this does not include food and lodging which is handled by Mountain lake Lodge ($171 per night which includes meals, lodging and gratuity, taxes are additional). While you do not need to come to the conference to become a Life Member, we would love to have you join us and we plan to recognize all Life Members at our Annual Awards Ceremony on Thursday night, October 18, 2018. If you have any questions, please feel free to contact Andy Sorrell or RPC Chairperson, Christy Straight. Note: Current members of the Executive Committee who may qualify for Life Membership are not eligible until no longer a member of the Executive Committee. Those in green text have accepted Life Membership. 10. Joseph M. "Joe" Cross, Jr.
Andy Sorrell if you can provide info!